Browse through many different options to help enhance your game day look and tailgating experience from Fanatics! What I like about Fanatics is they are an official partner with the NFL (as well as other professional leagues) and offer top name brands, they have an enormous selection of over 400,000 products so you are guaranteed to find something you like, they have an awesome rewards program, and they deliver top class customer service. What you’ll see below is a small snippet of the types of items you can find at Fanatics. 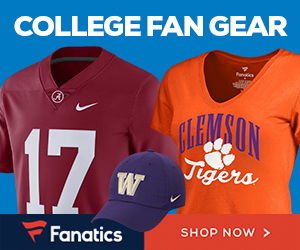 If you like what we do here at thetailgatingspot.com and would like to support us, you can help us out by shopping through our link to Fanatics. When you make a purchase after you click our link, they will share a part of that sale with us.